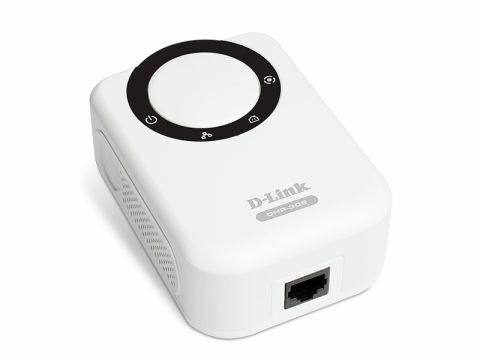 The D-Link DHP-303 Powerline HD starter kit consists of two Powerline adapters, two Ethernet cables and documentation. The adapters look like bulkier versions of the heating thermostat found in most homes. They are made of white plastic with a black control ring to highlight the four specific control modes. On the base of the units you'll find a single Ethernet port for creating your network. The supplied cables are a little short. They are fine for connecting to your broadband router, but you may need to buy a longer cable if your main work area is a little way away from the mains socket. Simply plugging the adapters into the wall and adding the supplied Ethernet cables is enough to make the connection. However, D-Link supplies a number of software tools to help you get the most from the kit. This includes using the built-in QoS engine technology to prioritise bandwidth to different uses, such as gaming or video and audio streaming. What we like about the DHP-303 is that you don't need to install the encryption software to secure your connection. Simply press the big white button on the front of the adapter and wait for the green LED light to flash and then press the button on the other adapter and the 3DES encrypted connection will be made. We found the connection speeds to be quick and reliable. D-Link claims it's fast enough to stream HD video around the home and our test video ran smoothly, with no delays across the network. There is one caveat with this device, however. The DHP-303 is based on the Universal Powerline Association (UPA) standard, which means it won't currently work with Powerlines that use the rival HomePlug technology. The DHP-303 Powerline HD is as fast and reliable to run as it is to set up. It may not be the most discreet or compact of Powerlines, but the connection speeds are both fast and efficient.